Come to captivating Bangkok ready for your senses to be stimulated like never before. A quick walk through these traffic-clogged streets can take you past serene Buddhist temples on one block and gigantic megamalls on the next as you pass rows of street vendors preparing fresh squid or marinated chicken at crackling charcoal grills, soups and curries in bubbling cauldrons or nimbly carving up fresh baby pineapples and hacking open baby coconuts with a machete. This city is, indeed, the culinary capital of Southeast Asia — and the abundance of markets, malls, and roadside stands also make it one of the best places in the world to shop to your heart’s content. 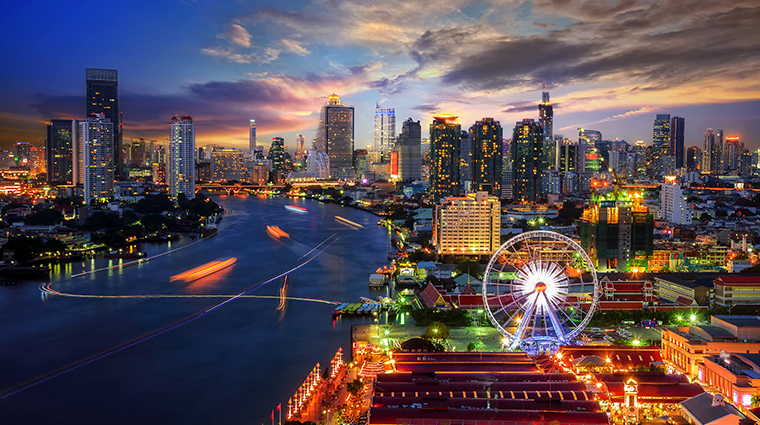 Whether you’re coming here to soak in the rich Buddhist culture and see the city’s compelling historical sites, or simply want to live it up in a well-priced luxury hotel and partake in the sometimes hedonistic nightlife scene, Bangkok can be whatever you want it to be. Whatever you do and wherever you go, however, expect to find friendly locals quick to return smiles and to have a memorable experience you won’t soon forget.